How to fix Yahoo homepage change? 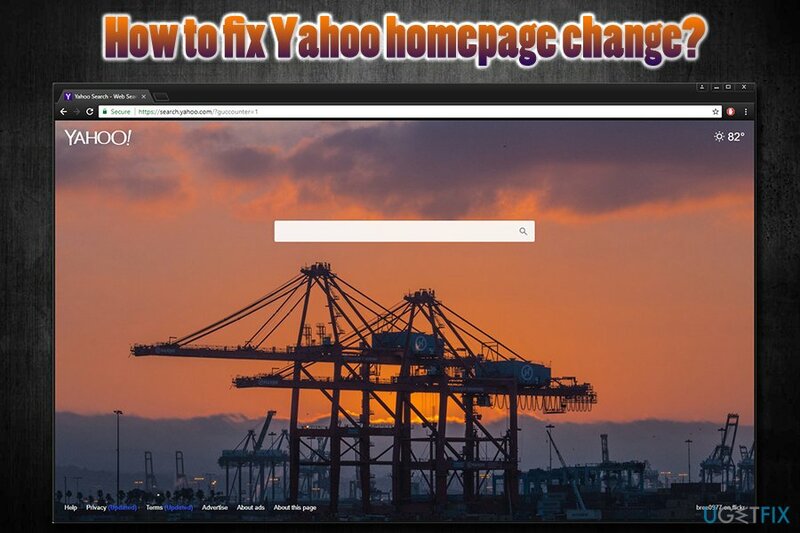 Home »	Uninstall » How to fix Yahoo homepage change? Issue: How to fix Yahoo homepage change? Hi. I always used Google.com as my primary search engine, as I find it is the most accurate and useful. Recently, whenever I open my browser, I can see a Yahoo homepage change on my screen. 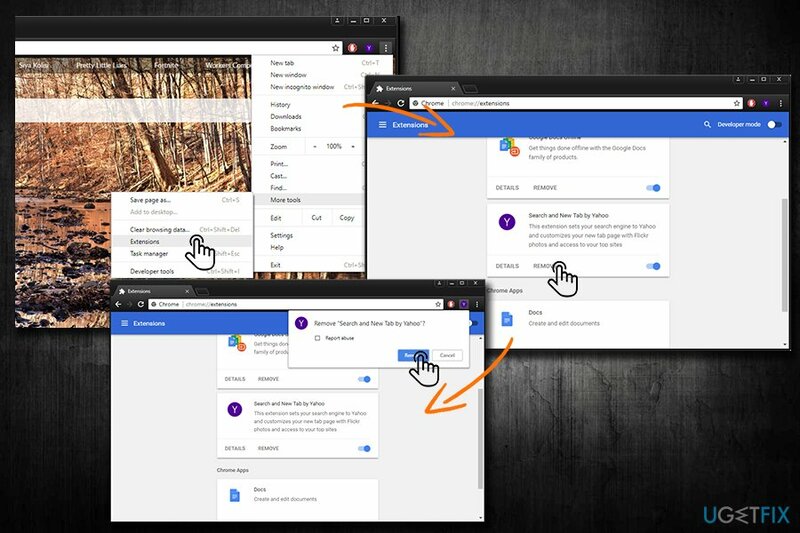 Whenever I want to browse the internet, I have to enter Google page manually, instead of it popping automatically. I have no clue why this is happening, but I would like to regain my Google homepage, please? Thanks in advance! Yahoo homepage change is simple to explain. You observed these changes because a potentially unwanted program hijacked your browser. 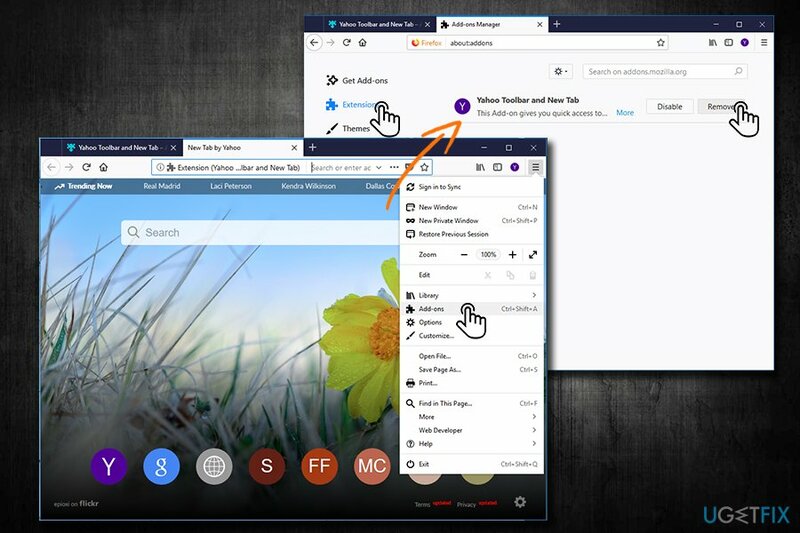 Browser hijackers often enter machines without users' permission and alter settings of Google Chrome, Internet Explorer, Mozilla Firefox, Safari and other browsers. 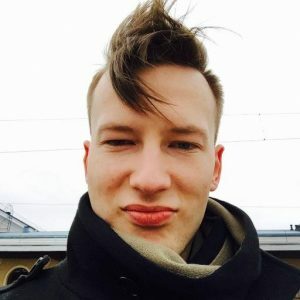 Although these unwanted guests are not considered to be malware, they definitely do not belong on users' machines, especially if they were injected unfairly. Yahoo is a legitimate search engine and used by approximately 2.1% of users worldwide. It is only behind Bling (3.07%) and Google (91.2%). Google search engine remains exceptionally dominant and reliable, and most users prefer it. Nevertheless, Yahoo partners with other organizations and affiliates which promote it via their products. This technique is called software bundling and is often used by freeware developers. If users do not pay attention while installing freeware, shareware or software updates, they might skip a pre-ticked tick box which indicates that Yahoo search engine will be set as a primary one. Also, users may also be offered optional components, such as toolbars, search engines, add-ons, etc. Unfortunately, in most cases, Advanced or Custom installation mode should be picked in order to avoid these applications. While most users still go for the Recommended method, they skip this step and suddenly find their search engine and home page altered. Display less accurate search results, etc. We can assure you that Yahoo on its own will not bring you to malicious websites, even if it entered your computer via software bundling. Nevertheless, if you noticed Yahoo homepage change, there is a high chance that you installed software without paying much attention and more PUPs might be hiding inside your machine. For extra security, we recommended scanning your device with Reimage. 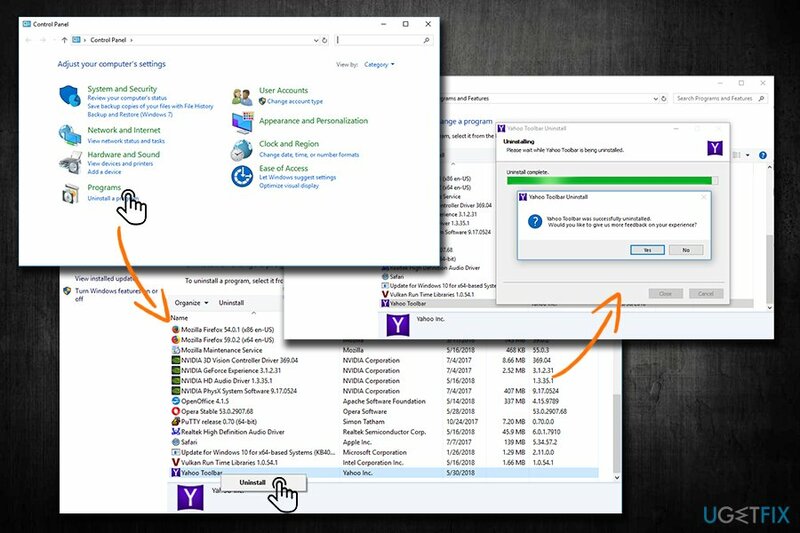 Without further delay, let's show you how to uninstall Yahoo from each of the browsers completely. ^ Margaret Rouse . PUP (potentially unwanted program). SearchSecurity. Online security information. ^ Search Engine Market Share Worldwide. StatCounter. Global Stats. ^ Non (Personally Identifiable Information) PII Data. Latent View. Marketing analytics.